Summary: The inevitable one-on-one fights between man and terminator, and terminator-against-terminator, are evidence of creative juices that have dried up completely. Just when you thought much-loved film franchises were getting decent reboots, along comes the new Terminator movie to disappoint and frustrate fans and neutrals alike. Star Trek put a new spin on the sci-fi series and Christian Bale has been breathing new life into the big screen incarnation of Batman. Here he flounders in the first Terminator movie set in the future as humans battle the machines intent on making them extinct. The setting is pretty much as you’d expect: John Connor (Bale) isn’t heading up the resistance, but he is a playing a major role in the battle against Skynet and its machines as they lay waste to the human kind. Having discovered a signal which could shut Skynet down like an off switch, the signs are good and an assault is planned on Skynet’s base of operations. Meanwhile Marcus Wright (Worthington), whose last known memory is signing his body away to Skynet’s creator Cyberdyne Systems while on Death Row in 2003, emerges from a prison confused the year is now 2018 and it’s a lot less friendly to be walking the Earth a free man. He bumps into a teenage Kyle Reese (Yelchin) in Los Angeles and together their set out to find Connor, though what Marcus is doing alive and well mean questions develop about his true origins and intentions. Christian Bale, so effective as Bruce Wayne and alter-ego Batman last year in Dark Knight, makes for a disappointing John Connor. Now a fully-fledged freedom fighter he offers a one-note hero driven by a past based on what he has been told will happen in the future. Uttering words in grunts and shouts, he’s not the kind of guy you root for, and neither is Reese who draws comparisons with Edward Furlong’s performance as a whiny but spirited Connor in T2. Surprisingly it is newcomer Sam Worthington who impresses the most as the gruff and focused Marcus, producing a deadpan display that nevertheless also expresses emotion Schwarzenegger could only dream of replicating: it’s no surprise to find he’s got some machine in him, but Worthington walks the fine line between being a mix of human and robot effectively – it’s a shame nothing, and no one, come close to his efforts. Terminator Salvation is undone by the complete inability of the writers to grasp that Skynet was envisioned as a ruthless computer programme which showed no mercy for the human race. The futuristic segments in past Terminators hinted at a dire future which Kyle Reese and Sarah Connor banged on about until the cows came home. The machines glistened against a perpetual night as they ruthless ploughed through the armies of the resistance: it looked like a grim outlook for on a barren, black landscape. 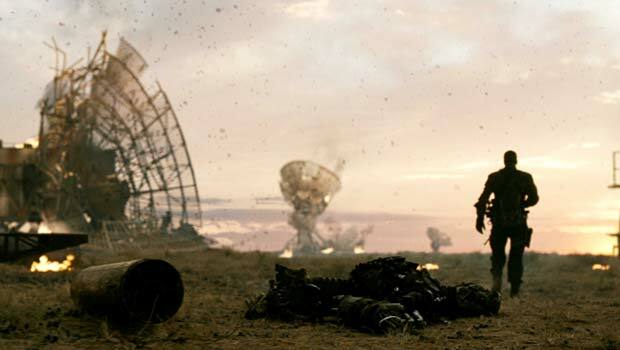 However, rather than keeping this harrowing setting for Terminator Salvation, we instead get a Mad Max look-a-like with most of the action taking place in deserts in beaten up old cars and trucks: the resistance seem to enjoy very little hassle from the machines unless provoked which is a far cry from what has gone before. This may be a franchise reboot, but it winds up looking and feeling like any other generic futuristic actioner, closer to the many Terminator clones from the 1980s than taking the ideas further as T2 did. Much of Terminator Salvation seems haphazardly thought out and the second-string supporting characters, including Bryce Dallas Howard stepping into Claire Danes role as Connor’s wife Hannah, and a fine turn from newcomer Moon Bloodgood, are introduced for plot points then quickly forgotten about. There are action highlights, though they are so woefully captured by McG their potential is not fulfilled. An opening attack on a Skynet base sees an array of satellite dishes bombed, a guard machine destroyed and frenetic movements from the resistance landing in helicopter and entering the complex. Plot dictates this will be a short sequence, though nothing of this scale is even touched on as brief skirmishes with a few terminators or flying vessels largely detract from this being a future where machines are everywhere. A giant walker terminator mid way through nods to the chase mentality James Cameron was so fond of in his directorial offerings; McG can’t recreate the tension Cameron was such an expert at pitching perfectly. When Terminator Salvation stumbles to a final act, the inevitable one-on-one fights between man and terminator, and terminator-against-terminator, are evidence of creative juices that have dried up completely. Arnie makes an unnecessary CGI appearance as the end emerges as a bastardised version of the conclusive fights in The Terminator and T2, but making much less sense given John Connor finds himself literally at the epicentre of Skynet’s activities where you might expect there to be machines lining up to shoot him in the head. Previously his life been under threat due to a rouge robot sent through time: surrounded by them he still seems lucky enough to only ever face one baddie at a time. It seems thinking too hard at the end of Terminator Salvation is not a good move as it’s clearly more than anyone involved did. The only redeeming aspect of Terminator Salvation is Sam Worthington’s performance; Bale will probably put this one down as a rare recent failure. Studio bosses will not hold high hopes for the sequels that were planned if they do get the green light – McG, who made a hash of two Charlie’s Angels films, certainly won’t be offered the opportunity to direct this franchise again.